Have you been looking for the perfect way to commemorate your year end award? Perhaps memorialize your beloved horse? Or maybe you want to show your trainer just how much you appreciate their hard work with a special gift? A custom portrait is the perfect way! 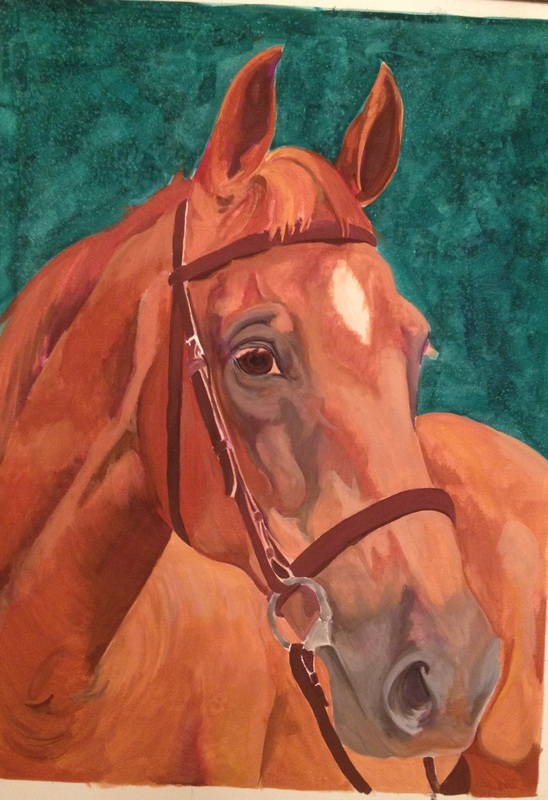 This custom portrait of your horse or pet (head and neck) is painted from your photograph. 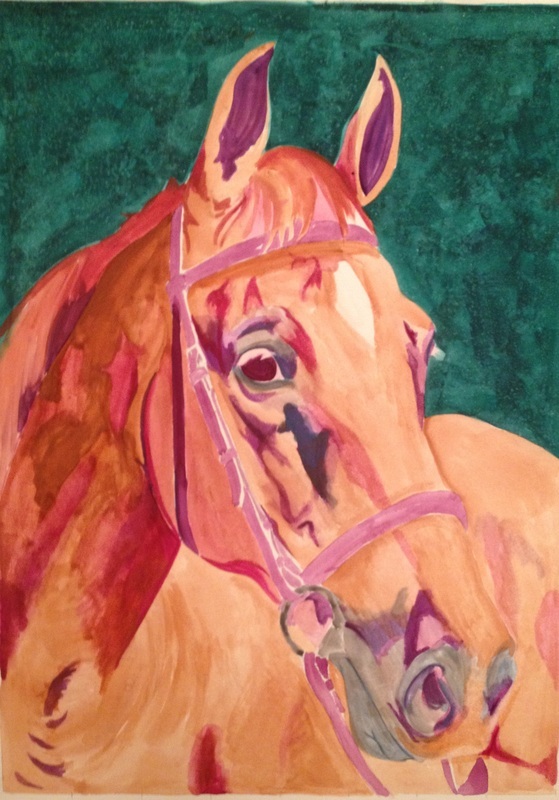 Your horse or pet's portrait will be done using gouache (an opaque type of watercolor) on acid free illustration board which offers a smooth surface to show off high quality detail, acryllics on canvas, or chalk pastels on acid free artists paper. The choice is yours. All are easily matted and framed under glass for a lifetime of cherishing. I prefer to work in color theory. This means that the colors are not 100% true to the photo, but instead have a cohesive color theme. Pictured here you'll notice that the gold tones have been brought out, and the shadows are enhanced with plum. This horse's show colors were plum and gold, so they were great compliments to accent his portrait. If you have a specific color theme in mind, please let me know so that we can discuss the details of execution in relation to your photo. I have what is considered a "painterly" style to my portraits. This means that yes, your horse will be recognizable as yours, but you will also be able to clearly discern this is a painting and not a photograph. You will be involved every step of the way. 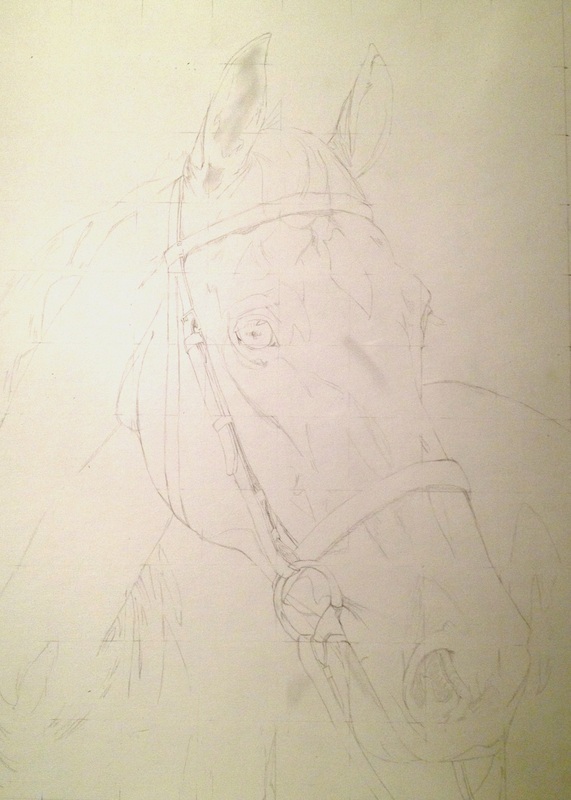 You will receive a photo of the initial sketch for approval, and at incremental times throughout the painting process. Most paintings this time of year are on your doorstep 3 weeks from the purchase date. They are shipped meticulously packed for safe travels, with tracking and insurance. ~a high resolution photograph of your horse that is in focus, in good, contrasting lighting to show off detail, where your horses's head already takes up 50% of the space. I can crop it further, but even in high resolution you'll want the original document to be close to the cropped space you'd like for your portrait. The above example photo was taken by a professional photographer, and the results speak for themselves. 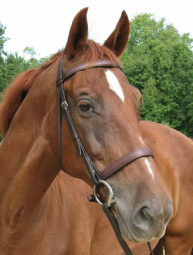 ~Multiple photos are a great way to help me understand your horse's personality. It is not required that you submit multiple reference photos, but they do make the process more enjoyable for me, and I do think it positively effects the finished product.